I first started with his books The Secret of The Flower of Life Vol. 1 and Vol. 2 and thoroughly enjoyed them even though they were very technical types of books. 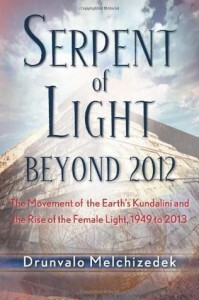 The Serpent of Light was written very differently which was a nice changed. You can actually get a sense for his personality and who he really is as a person. The stories Drunvalo shares in The Serpent of Life are inspiring, whether you believe what he is explaining actually happened or not. If you are not familiar with who he is, I would encourage you to visit his websites, watch some of his youtube videos and read the two books I mentioned above. It doesn't matter, as I said, whether you believe him or not...but it does matter for you to understand and feel the underlining message he is trying to convey. There is peace and beauty in this world if you are willing to look for it. As Drunvalo has done and recommends, I would do the same...step out of your head and step into your heart and then you will find a whole new world opening up to you!